This Handbook provides a self-contained survey of the current state of defense economics in the form of chapters prepared by leading specialists on various aspects in the field. The volume summarizes not only received results but also newer developments, from recent journal articles and discussion papers. Theoretical analysis, econometric techniques, and policy issues are addressed. The chapters fall into two essential categories: surveys and conceptual studies. Survey chapters present a synthesis, interpretation, and evaluation of the literature for particular subfields of defense economics, whereas the conceptual chapters elucidate the analysis of specific topics. Both types of chapters provide directions for future research. As with other volumes in the Handbooks in Economics series, this Handbook will be a definitive source, reference, and teaching supplement for use by professional researchers and advanced graduate students. Abbreviated Contents. Introduction (K. Hartley, T. Sandler). Defense economics and international security. (M.C. McGuire). World military expenditures. (M. Brzoska). The demand for military expenditure. (R. Smith). Military alliances: Theory and empirics. (J.C. Murdoch). Arms races and proliferation. (D.L. Brito, M.D. Intriligator). Theorizing about conflict. (J. Hirshleifer). Insurrections. (H.I. Grossman). Terrorism: Theory and applications (W. Enders, T. Sandler). Defense expenditure and economic growth (R. Ram). Military expenditure and developing countries (S. Deger, S. Sen). Incentive models of the defense procurement process (W.P. Rogerson). The economics of military manpower (J.T. Warner, B.J. Asch). The defense industrial base (J.P. Dunne). 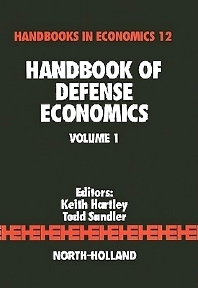 Economics of defense R&D (F.R. Lichtenberg). Industrial policies in the defense sector (K. Hartley). Regional impact of defense expenditure (D. Braddon). Economics of arms trade (C.H. Anderton). Economics of disarmament (J. Fontanel).